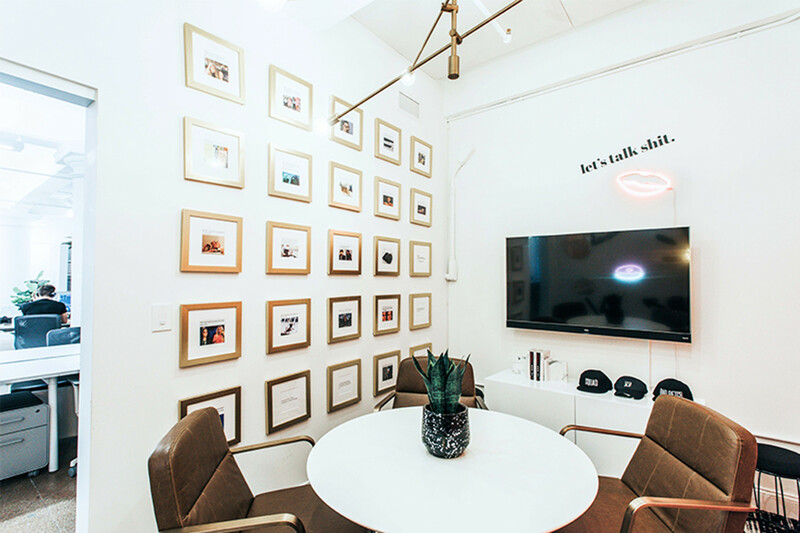 Take a peek the multi-media brand's NYC digs. If you have been on the internet in the past seven years, it's likely that you have come across a meme, video, or hilarious article from Betches. What began as a satirical blog started by a group of college friends, quickly grew into a pink-hued viral phenomenon. 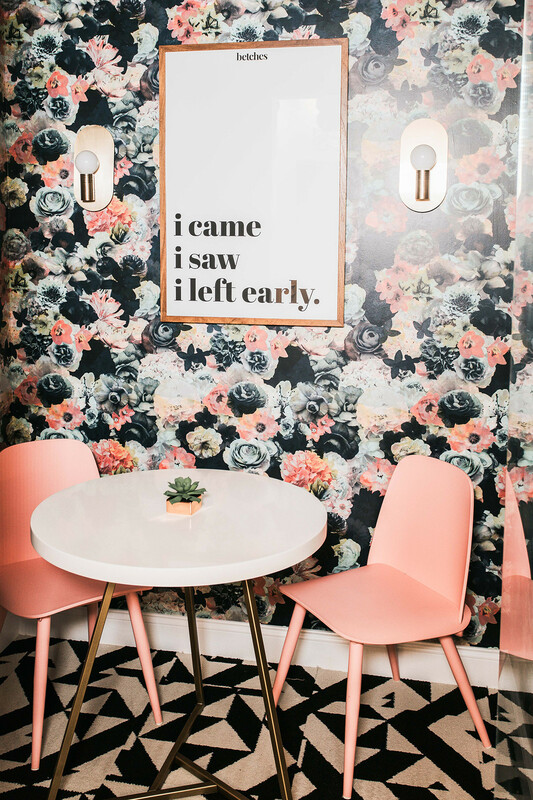 Tapping into a funny, honest, and playful tone of fellow millennial women, the founders created an online resource perfect for sharing and adding a bit of humor to our daily experiences. We also love that these betches aren't afraid to speak their minds or drop a F-bomb or two. As the company has expanded into a variety of new platforms from podcasts, to a political newsletter, to multiple social channels, it also needed enough space to foster content and fit a growing team. 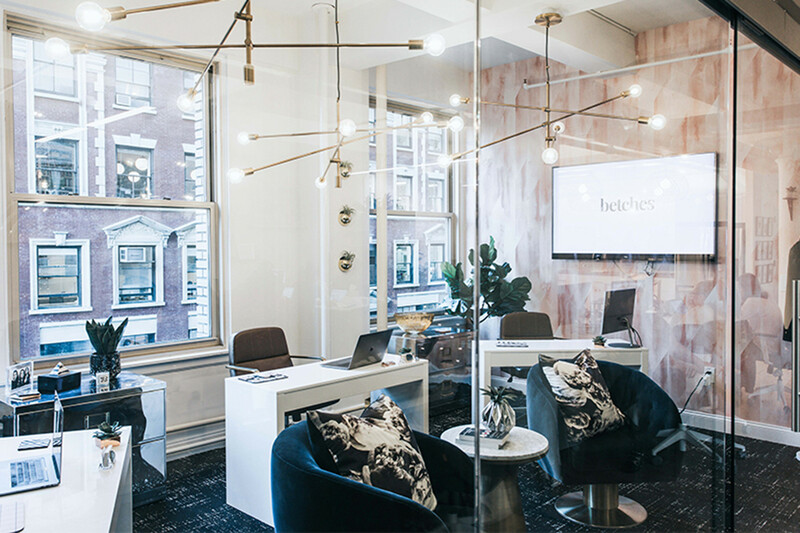 So the Betches crew moved into a new office, complete with a design that totally captures its modern, funny, and stylish ethos. 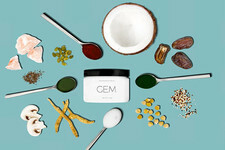 We asked co-founder Aleen Kuperman to spill what it has been like to build a fun side project into a major media company, and how the new office space is launching the next chapter of the brand. Read ahead to get insight into Betches rise to fame (they can't help it that they're popular). Lonny: Can you share the origins of how Betches first got started? Aleen Kuperman: Betches was founded in 2011 while we were seniors at Cornell University. I was living with Jordana Abraham and Samantha Fishbein, my co-founders, at the time, and the three of us launched the blog as a way to combat fratire culture. We didn’t have plans for the future of the blog at the time, but it quickly became clear that what we were writing was resonating with our audience in a pretty powerful way. When we graduated, we decided to give this a real shot and committed to making Betches our full-time jobs and even got our first book deal. We worked really hard to identify what exactly this company would look like and what we wanted to be. Since its inception, the three of us have honed Betches into the robust humor and entertainment media company it is now. Did your team ever imagine how quickly it would grow? AK: When we first started, we didn’t know how much we would grow. We quickly realized how unique our brand was and that there was a real need for this content, specifically for millennial women. We organically began to grow our content offerings within other platforms like podcasts and video, as well as our work with like-minded brand partners. What has it been like to see Betches change from a satirical site to a multi-faceted media company over the years? AK: It’s been exciting to see Betches expand and become the force that it is today, and we love that our audience has grown along with us. We started as a satirical blog writing about what the three of us thought was funny and now have developed into a multi-faceted media company that creates content on multiple platforms that resonates with a much larger audience than we originally anticipated. Over the past seven years, we’ve rapidly expanded our content offerings across social media, online, podcasting, e-commerce and more. We now have a full podcast network with shows that we create and produce, three published books, a successful e-commerce arm, and a thriving and growing social media business. What has it been like for you and your team to finally move into your own office? AK: Moving into our new office made a huge difference in our productivity and creativity. Not only are we able to collaborate more effectively but it became a space for us to come together as a team. In our new space we can now do celebrity interviews on our pink couch, record all of our original videos, and host happy hours at our office with our brand partners. It was also just a huge milestone for us as a company. 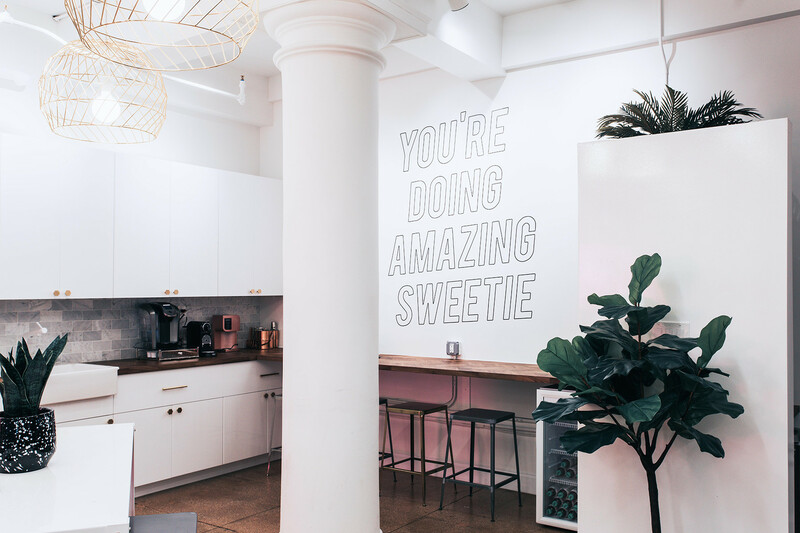 As Betches was growing, we really needed a space that felt like home for us and our employees. The process of designing it was important to us and a lot of fun. 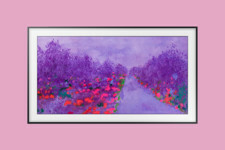 It was designed by Labl Studio - a female founded boutique design company. One of the founders, Ali Levin, is also a Cornell alum. Working with likeminded women is one of the cornerstones of Betches, so it felt like a really great fit to work with Labl and for two female-founded companies to be supporting each other in this process. Did you style the office in a particular way to better facilitate making content for your site and social channels? AK: When designing our office space, the most important thing to us was to create a space that would foster creativity and openness. We also designed it so it's modeled after the heart of Betches — which is honest humor — that is also super Instagrammable. Like all things Betches, the office is chic and modern, but with hilarious and topical gems spread throughout. 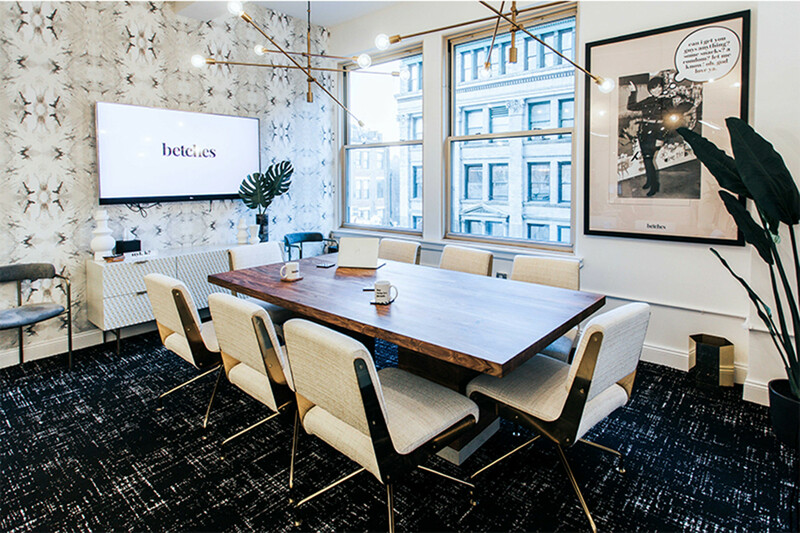 It’s the perfect balance between beautifully curated conference rooms with printed white walls and eclectic light fixtures and everyone’s favorite pop culture quotes and memes that make us laugh. We want everyone working at Betches to laugh and enjoy their work. Our office encourages that which manifests itself in the content we create. AK: The podcast studio is my favorite part of the office. It’s intimate, but so on brand. 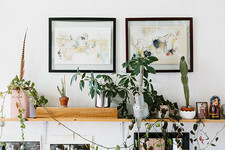 On one wall we have a beautiful pink splatter design, on another we have neon signs, and on another, a floor-to-ceiling framed gallery wall of our favorite memes. The studio facilities the creative, open, and funny conversations you hear on all our podcasts. How do you hope to see Betches continue to grow? AK: We’re going to continue to grow our content, especially within our owned channels, through brand partnerships, our podcast network, and so much more. One area we’re excited about is expanding into is IRL activations and live events. We love opportunities where we can bring our audience together outside of social media and bring the brand to life, so we’re planning a lot of exciting things in the near future. AK: We just released our third book, When’s Happy Hour? Work Hard So You Can Hardly Work. Written in Betches’ signature snarky, authentic tone, the book is a career guide offering readers an honest and hopefully funny take on how to be successful in your career, no matter what that career is. We’re really proud of this one because we haven’t seen anything else like it, and it was something our fans have asked for since we started this business. The book has real practical advice and career guidance, but is also a lot of fun to read. We know that our audience is curious and ambitious, but also wants to have fun and laugh while figuring it out. So we’re happy that our book can do both.